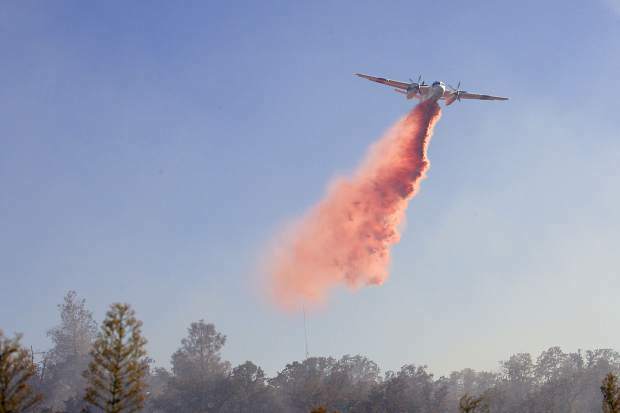 A CAL FIRE S-2T airtanker drops fire retardant on the 2009 49 Fire in Placer County. Gov. Jerry Brown signed legislation on Tuesday, July 25, that renews the state’s cap-and-trade program — an effort to cut greenhouse gas emissions and combat climate change — which also includes a provision to suspend the controversial fire prevention fee paid by rural homeowners. The state collects an annual payment of $150 from homeowners who live in areas where the state is responsible for wildfire prevention and suppression. The fee was intended to offset a portion of CalFire’s budget that was cut during the recession era in an effort to reduce California’s massive budget deficit. The state’s responsibility area — nearly a third of California — includes land that is not within incorporated city boundaries and is not owned by the federal government. Homeowners who also pay into a local firefighting district, which includes roughly 95 percent of those in the state responsibility area (SRA), pay a reduced annual rate of $117.33. The fee has been a source of heated contention in Northern California. Collected funds are supposed to be earmarked for wildfire prevention services, but opponents of the fee say they aren’t seeing a return on their dollars. Sen. Ted Gaines (R-El Dorado), who has fought the fee since its adoption in 2011, told The Union in March that the money paid by rural homeowners for fire prevention services goes into the state’s general fund and gets “intermingled.” Not all of the fire prevention funding, he said, is serving its intended purpose. But the state may soon suspend the fee and instead opt to fund fire prevention services through a tax on carbon emissions. The California Global Warming Solutions Act of 2006 requires companies to buy permits to release greenhouse gas emissions. The program was slated to expire in 2020, but California’s Assembly Bill 398, if approved, would renew the program until 2031. The bill was passed by legislators in both the Senate and Assembly on July 17, and was backed by Brown, who pushed for renewal as part of his agenda to combat climate change. The renewal bill also includes a provision that suspends the fire prevention fee for homeowners living in state responsibility areas until 2031 — a result of negotiations that helped gather bipartisan support for extension of the controversial emissions-reduction program. The bill allocates nearly $80 million a year for fire prevention efforts through its cap-and-trade program — money that will come from the sale of greenhouse gas emission credits. “The big question is whether or not the grant programs that have been benefiting from those funds will continue to be funded,” said Joanne Drummond, executive director of the Fire Safe Council of Nevada County. Several wildfire prevention programs have been funded by grants from CAL FIRE since the implementation of the fee, according to Drummond. Those programs, she said, include defensible space inspections and enforcement, wood chipping and hazardous tree removal. Drummond noted, however, that it’s difficult to distinguish which programs have been funded by the prevention fee, and which have been funded by Brown’s emergency declaration following California’s most recent five-year drought. The collection of fire prevention fees, Drummond said, coincides with the timeline of the drought. But Drummond said the State Responsibility Area fee has been beneficial to maintaining Nevada County’s defensible space. Nearly three-quarters of the 31 million acres of land the state is responsible for is considered a high or very high fire risk. Nevada County Supervisor Hank Weston, a former CAL FIRE unit chief, argues that Nevada County is subsidizing fire prevention services in other parts of the state by paying the SRA fee. In a letter written to CAL FIRE Director Chief Ken Pimlott in May 2015, Weston wrote that counties in the Nevada-Yuba-Placer Ranger Unit contributed roughly $7,702,847 to the fire prevention fund from 2013-2014. However, in 2014-2015, the unit received $3,216,599 in services — about 42 percent of what it paid. In 2012, the Howard Jarvis Taxpayers Association filed an ongoing lawsuit against CAL FIRE and the State Franchise Tax Board, arguing that Assembly Bill 29, which enacted the fire prevention fee, was passed illegally. A law passed in 2010 requires a two-thirds supermajority vote in the state legislature for approval of many fees and taxes, but the fire prevention fee did not receive a two-thirds majority vote. Laura Murray, a staff attorney for the association, said a motion for summary judgement is planned for later this year. Despite the likely suspension of the fee, the association is “still moving forward with the case,” Murray said. Mary Eldridge, a spokesperson for CAL FIRE’s Nevada-Yuba-Placer unit, said that there has been “no increase, and no decrease” in wildfire prevention services from the department directly related to the fee. She said implementation of the fee offset a large cut to the department’s funding, so changes to service weren’t calculable. “The numbers didn’t really change, the money was just moved around,” she said.